Nonprofit Spotlight: Center for Teen Empowerment | Rochester Young Professionals, Inc.
Join Rochester Young Professionals as we volunteer to participate in the hiring process of youth at the Center for Teen Empowerment in the months of September and October. In the process of the interview, the youth teach and learn a lot about their community, how their peers are thinking about things that seldom come up in everyday conversations, and most importantly, that they are not alone and that together they can do something to make the community a place they love and feel loved by. We sat down this month with the Development and Collaboration Manager at the Center for Teen Empowerment, Jennifer Banister, who tells us more about why TE is a place where low-income youth want to stay to invest in themselves and their community. Since 1992, The Center for Teen Empowerment has engaged low-income young people (ages 14-20) as leaders of efforts to unite their peers and improve their communities. Working in Rochester, Boston and Somerville, MA, TE hires youth to identify the most pressing issues in their communities and develop a strategy to address those issues. 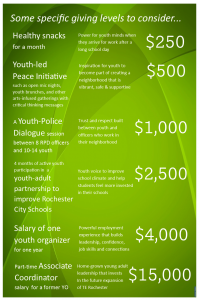 Each year, TE youth organizers (YOs) conduct over 150 initiatives that involve over 5,000 youth, residents, public officials, and police in efforts to build peace, justice, and community. TE opened our Rochester program in 2003, where we’ve employed 459 youth who have engaged more than 12,000 youth and adults in dynamic initiatives including youth-led conferences, forums at City Hall, marches and speak-outs, a Youth-Police Collaborative Action Process, Mayor’s Youth Advisory Council, as well as collaborative efforts like the Solutions Not Suspensions campaign, and social gatherings for youth by youth that build hope and empowerment through consciousness-raising arts, community building and much more. TE has done all of this in Rochester with 4 full-time and 2 part-time adult staff, and 12-14 youth staff each year. We have a volunteer Advisory Board of 14 people currently and a handful of other neighborhood folks who help out preparing food for the YOs’ events, DJing, etc. We also are blessed with pro-bono IT support and architectural design services preparing us for our next moves. Currently, TE has only one neighborhood-based site in Rochester’s Southwest quadrant. We are working toward opening future sites in the Northeast and Northwest neighborhoods. When the Boys and Girls Club shooting happened as a basketball game was letting out in 2015, what wasn’t reported is that the shooting was done by young people from another quadrant of the city. The reality is that young people all over our city need opportunities that allow them to contribute to their community and grow skills for their future. Hope builds when jobs are visible in your own neighborhood and when you see your peers leading and being valued. People regularly remark about how much calmer Genesee Street (where TE is) feels without the regular fights and open-air drug markets on the corners. Neighborhoods are not islands and our city, including downtown, is affected by the level of healthy and safe in our neighborhoods. The Teen Empowerment Model™ is built on multiple neighborhood-based sites, as our sister sites in Boston and Somerville, MA, have had over the years. TE needs to be in multiple neighborhoods in Rochester so that we can triple the number of young people employed to bring together thousands of their peers and reach a tipping point of youth-inspired change in our city. TE is ramping up to create a growth campaign to realize our vision of multiple neighborhood-based sites in order to operate closer to scale for Rochester’s approximately 30,000 youth. This project will expand opportunities for low-income Rochester youth to take meaningful action to improve their lives and communities. Currently, TE employs 13 youth organizers and at least 10 additional youth associates (YAs) annually to engage 600-1,000 peers and community leaders in one neighborhood. After our planned expansion, we will employ more than 36 YOs and 30 YAs to engage 1,800-3,000 people across the city. TE is looking for champions who can help get the word out about the youth organizers’ work and help us expand across the city. You can do this by hosting awareness gatherings (house party, a breakfast at work, a “jeans” or “dress down” day pool). People have come to us to host all sorts of “interesting” fundraisers, from RYP’s Casino Night in 2014, Karaoke contests & women’s arm-wrestling tournaments… Be creative! We do not have regular volunteering opportunities but will have hands-on needs in the future as we expand or when we have larger events. (You may remember from your own adolescence that what make youth initiatives cool is when adults seem scarce. The YOs run their events and we adult staff operate in the background. So, unless it is a larger initiative that needs more hands, generally only a few volunteers are needed). We are very excited about joining forces with young professionals. We see it as an ideal network since the younger generations will bring Rochester into its next form. Volunteering is about giving back to, investing in our community. Often the nature of inequality and segregation in our community makes volunteering about offering a hand to help people in need. Connecting with TE is about a hand-across—a sense that we can and must build this community together. 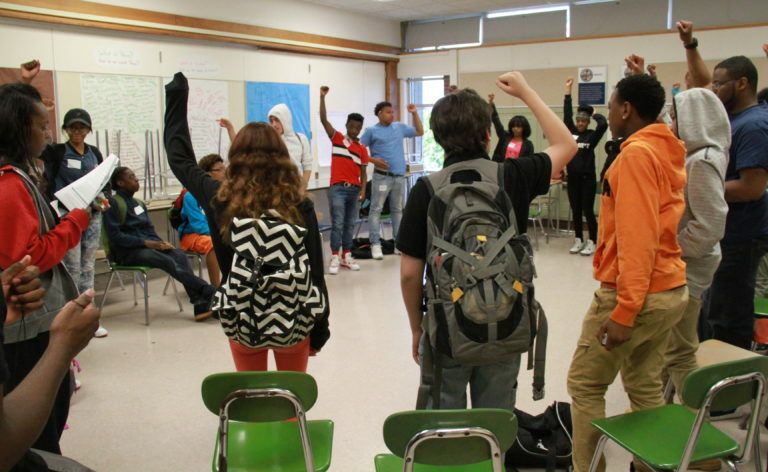 Youth who face poverty, racism, violence and attend schools labeled as failing are also filled with talent, energy, and creativity that we need in order to spread the benefits and sustainability of Rochester’s latest transformation. Thanks for your interest in getting involved!